Megan Racing introduces the new SPEC RS Coil Over system. The new SPEC-RS coil over system features 32 Levels of damper force adjustment, rebound and compression, full-height adjustment, these damper kits are then perfectly matched with front and rear Pillow Ball upper mounts for camber correction in most applications. The adjustment for dampening is as simple as can be, with a built-in knob at the top for rebound adjustment and a built in knob for compression adjustment, mounted for easy access. Simple adjustments can be made to tune to your style of driving and comfort level desired. Dual-Adjustable dampers make suspension adjustments easy to tune whether you’re a professional race car driver or an automotive enthusiast with amateur driving skills. On most applications, the Megan Racing Spec RS Damper Kits come with fully adjustable Pillow-Ball upper mounts to easily tune and adjust your camber. Adjustable camber gives you an edge on most suspension setups, as you can easily tune your car for any ride height which improves handling, predictability and furthermore tire wear, which is a great benefit both on the racetrack and on the street. 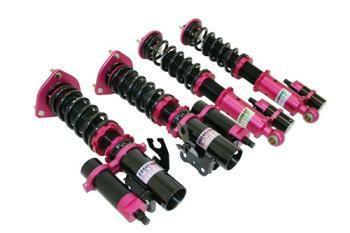 The quality and durability of the Megan Racing Damper kits are unmatched. Made of extremely durable Steel and featuring springs that are constructed of SAE-9254 Cold-Wound Steel which is then tested over 500,000 times by compression inspection. With deformation less than 5% and high strength sophisticated surface coating, we stand by our product with our strong warranty. 32 Levels of rebound and compression adjustability. NOTE: Spec RS will not be able to adjust to stock ride height due to the coil over design. This coil over system is design to lower your vehicle to extreme measures.